Most of us have experienced how annoying a dead phone battery can be while out and about, but thanks to the best solar backpacks on the market, you’ll always be charged and ready to go. Now, a simple stroll in the park on a sunny day can fully charge your cell phone quickly and efficiently, without the need for a wall outlet. These futuristic backpacks integrate low watt solar panels, power banks and USB cords to charge devices on the go. Some even come equipped with extra bells and whistles, like hydration bladders, anti-theft protection and ventilation systems. Whether you’re a student commuting an hour to school, or an outdoors enthusiast prepping for a multi-day trek, a solar backpack can be a convenient and eco-friendly way to keep your devices from dying prematurely. The High Points: Includes high capacity power bank that can charge laptops. The Not-So: Is the most expensive bag on the list. The Voltaic Systems Array backpack presents a whole new way of traveling. With advanced solar panels and a high-powered charging bank, the Array is completely location-independent. In fact, this bag is best for digital nomads who pack a lot of gear, especially photographers. The Array can charge a whole range of devices on a single solar charge and is durable enough to use in a variety of climates. While it’s safe to use in rugged environments, the black and red clamshell design is professionally attractive and doesn’t look like a typical hiking backpack. Its large capacity and abundance of pockets make it perfect for small trips or tech-intensive travel. The majority of reviewers are very happy with their Voltaic System Array backpacks. They claim that the battery and solar panels work as the manufacturer advertises them, and are capable of charging a range of devices. Travelers have taken their bags as far and wide as France and West Africa with no issues. Some buyers complain that the backpack itself is clumsy and bulky, which isn’t suitable for urban environments. Others complain that the panels are relatively useless in shadow cover. However, we should mention that this is a standard issue for most solar energy devices. Voltaic Systems’ range of backpacks are full of top-of-the-line features, but the Array model really outshines the rest. With three 3.5W monocrystalline panels and a 19,8000 mAh battery pack, the Array can charge smartphones, tablets, laptops, DSLR cameras and more. 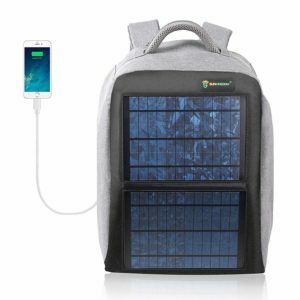 Perhaps the biggest selling point for this backpack is its ability to fully solar charge a laptop in one go. The panels boast a 19% efficiency rating, and can charge 7 smartphones, 3 tablets or 1 laptop when the solar power bank is full. The power bank offers USB and Hi-Voltage laptop outputs that are FAA compliant for carry-on luggage only. The backpack also offers your expensive tech some protection with waterproof fabric and weather-resistant solar panels. The backpack itself is a 25L clamshell design, complete with a 15-inch laptop sleeve, 10-inch tablet sleeve and dedicated smartphone and battery pockets. You can easily squeeze in enough gear for on-the-go work or play, with room to spare. However, it does come at a price: an empty backpack weighs in at a hefty 5 pounds. The High Points: Designed with many uses in mind. The Not-So: Lower wattage compared to other brands. As a lightweight, versatile backpack, the SUNNYBAG Explorer+ is a great choice for a variety of buyers. With a 6W solar panel that’s able to charge a smartphone in 2 hours, the backpack packs a punch at a reasonable price point. The variety of features, paired with the high-quality design, make this bag stand out from the rest. From students to hikers, the SUNNYBAG Explorer+ can handle the load. While the wattage is lower than some other models, it’s enough to charge small devices. Be aware that this bag does not store power and an external battery will need to be purchased if you’d like to charge your devices after the sun has set. Most reviewers are very satisfied with their SUNNYBAG Explorer+ backpacks. They appreciate the quality design and effectiveness of the solar panels. One professional tech reviewer claims that this bag has performed better than other similar models and brands on the market. Others are happy with the fact that the solar panel is removable for remote charging. The convenience aspect of the backpack is a key selling point for most buyers. They claim that it’s a great value for the price point. The well-designed SUNNYBAG Explorer+ backpack offers versatility with its removable solar panel and durable build. The 6W solar panel has an efficiency rating of 22% and the company boasts that each individual solar panel is certified before being shipped, so you can guarantee quality. There’s also an LED indicator that notifies you when the backpack is fully charged and ready for use. In direct sunlight, a smart phone can be charged in 2 hours or less. Larger devices, like tablets or drones, take 5 to 7 hours. In cloudy weather, a phone may take up to 4 hours to charge. 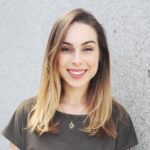 The backpack only works with USB devices, and does not store power so an external battery bank will need to be purchased if you wish to charge after dark. The backpack is made of weatherproof polyester fabric and can carry a 15.6-inch laptop, along with other small devices. The chic and tech-savvy bag can be used with or without the solar panel should you wish to pack it up for safe keeping. The High Points: A spacious interior and built-in hydration bladder makes this the perfect bag for long hikes. The Not-So: The bag is much too large and cumbersome for daily use. ECEEN is known for their variety of high-end solar-powered backpacks, and the hiking backpack is no exception. With an incredible range of bells and whistles, the ECEEN hiking backpack provides a lot for a low price. This bag is great for outdoor adventurers who’re looking to charge their small devices on the go. With several great features, like a built-in 2L hydration bladder and 10W detachable solar panel, the ECEEN can service hikers for up to three days in the wilderness. Based on its size and capacity for carrying gear, it’s not well-suited for week-long trips. It’s also a little too big to use for daily commutes, so save the bag for long weekends to the mountains. Buyers have mixed reviews regarding the ECEEN hiking backpack; some love it, and some are less than enthused. However, the general consensus is positive, and most are impressed with the wide range of features. The most positive points of consideration for reviewers are the comfort of the bag, the versatility of the solar panels and the included power bank. However, some mention that the bag is not as spacious as it claims and may not be well-suited for those with an entire load of gear. This may be an issue for hikers in cold climates who need extra equipment. The ECEEN hiking backpack is perfect for any outdoor enthusiast. The bag comes equipped with all the essentials of an ordinary backpacking pack, like a 2L water bladder, external frame, rain cover, zipper compartments, hip belt and ventilation. It also includes a detachable 10W solar panel that can charge your devices quickly and efficiently. The solar panel is unique in that it’s secured to the bag by carabiners and can easily be removed and folded up. This means you can leave your panels in full sun at camp and charge your devices at night, without the burden of carrying your expensive electronic equipment with you in the wilderness. The 10W monocrystalline solar panels have a 22% efficiency rating. The backpack also comes with a 10,000 mAh battery pack with double USB ports. Depending on the amount of sunlight available, the pack can easily charge a variety of small devices, like cameras, tablets, and smartphones. The backpack is designed for long-term comfort, and includes adjustable suspension for various torso lengths, padded shoulder straps, a density foam hip belt, ventilation and a removable external frame. The 2L hydration pack comes with an external drinking straw for easy access. The charging cables can also be used easily while wearing the bag, so there’s no need to put it down. The High Points: Offers high wattage solar panels for an unbeatable price. The Not-So: Does not include a power bank. 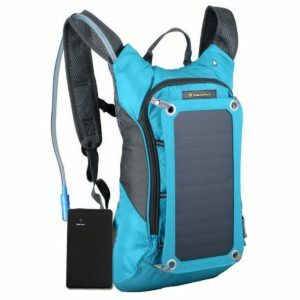 As both the cheapest and highest wattage bag on our list, the Sunkingdom Solar Power Backpack is a great pick. With a soft grey anti-theft clamshell design, thick padded back and professional touch, the backpack is perfect for digital nomads who frequently travel with electronic equipment. And there’s no need to worry about international flights: the bag is safe to bring on planes. While the Sunkingdom is a budget choice, the lack of power bank may up the price for buyers who don’t already own an external battery. However, it’s still a heck of a deal as the quality of the bag is more than worth the price compared to other competitors. Buyers are very impressed with the quality of the backpack as it’s well-made and offers a lot of value. It does what it advertises and can quickly charge cell phones in full sun. The theft protection zipper is also a nice touch. Some reviewers complain that the bag won’t charge at all unless it’s in full sun, although this is common for most solar devices. Others took issue with the fact that the USB cord can be used externally, which is inconvenient for on-the-go charging. In the same vein, one reviewer was disappointed that the solar panel couldn’t be removed and safely stored when not in use. With high efficiency 12W solar panels, the Sunkingdom solar power backpack offer travelers the ability to charge a wide variety of devices. The backpack also includes 1 USB port, which does limit the number of devices you can charge in a single session. You will need to purchase a separate external power bank as the backpack does not come equipped with one. The backpack is designed to allow airflow in the back with ventilated padding. It’s also built with water-resistant fabric and includes a separate compartment for a 15.6-inch laptop. There’s another larger main compartment and two side pockets for other items. The High Points: Stylish and low-profile design. The Not-So: Doesn’t include a power bank. As one of the most subtle and stylish bags on our list, the FARAZ is perfect for professionals and students alike. 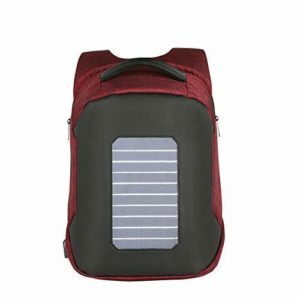 The bag includes an external USB charging port, an integrated front solar panel and numerous device compartments. It also includes anti-theft protection for those carrying important or expensive items. The cheap price point is ideal for those looking to dabble in solar technology, but not ready to fully commit to an expensive, top-of-the-line model. The FARAZ backpack is a great middle ground, offering a few basic features that work well. Reviewers adore their FARAZ solar backpacks. For buyers, the highlights include its versatility, light weight, and charging efficiency. Reviewers have used their backpacks to travel, for school and even hiking. Overall, the backpack is very practical, and the integrated safety feature is an added bonus. There are no negative reviews for the FARAZ solar backpack. The flat-front FARAZ solar backpack includes an integrated solar panel that seamlessly integrates into the modern design. The 6W solar panel can charge a range of small devices in full sun, although the bag does not come equipped with a power bank; a battery will need to be purchased separately. With discreet cell phone side pockets and flat zippers, the FARAZ bag boasts anti-theft protection for your devices. It can also accommodate a variety of devices with its numerous compartments for phones, laptops, tablets and more. The waterproof bag is lightweight with a padded back for extra comfort. The High Points: Includes a 1.8L hydration bladder pack. The Not-So: The small capacity bag is not suited for trips longer than a day. With breathable mesh, high-quality PVC material, a built-in hydration bladder and lightweight design, the SolarGoPack is the ultimate solar backpack for athletes. The pack mimics other bags designed for cyclists or distance runners, with a close-to-the-body cut and hands-free water hose. And while there may be higher-quality daypacks on the market, none have the magic of a built-in 7W solar panel. The solar panel provides just enough juice to power your smartphone or other small electronic device. This is great for those who love to venture off the beaten path or listen to music on long runs. The SolarGoPack is not well-suited for multi-day trips or packing a lot of gear, however. Overall, reviewers are very satisfied with their SolarGoPack Hydration Backpacks. They are impressed with the powerful battery that can charge smartphones quickly. They are also pleased with the size. One customer was so satisfied that she purchased an additional pack for herself and another one for a friend. She claims that the high-quality pack is made with an eye for the details. She recommends taking the water pouch out if you’d like to use the bag as a day pack. The SolarGoPack is small and portable but has space to fit the essentials. At only 3 pounds, the bag is light enough for runners or cyclists to bring on an excursion. The pack also comes with a 1.8L hydration bladder which is perfect for any type of mobile athlete. With sport-quality PVC fabric, the pack can withstand a variety of rugged environments. It’s also waterproof and can protect your expensive electronic devices from the elements. The bag comes in a bright blue or rust red color and should be visible in dim conditions. The pack features a 7W solar panel with a 22% efficiency rating and protective voltage stability control. The panel is hooked up to a 10,000 mAh battery and can provide enough power to charge a smartphone, iPod, or GPS device on-the-go. Should you wish to leave the panel in the sun to charge, or use your bag without it, you can simply unbuckle the panel from the pack. What will you be using your solar backpack for? What are you planning on charging? Will you be doing physical outdoor activities with your backpack? How big of a backpack do you need? Picking a backpack for daily use is already a difficult decision. When deciding on the right solar power backpack, it’s important to consider how and why you’ll be using your bag. While there are a variety of factors at play, from cargo load to charging capabilities, these are the most important variables to consider before purchasing. There are a variety of uses for solar backpacks, and one size does not necessarily fit all. Based on your use, this may determine the wattage of the solar panel, the size of the bag, the material and design of the bag and the extra features. For those using their bags to commute to work, while touring a foreign city, or carrying books to class, a lightweight bag with a low wattage solar panel and anti-theft protection is perfect. Having an external USB port is also convenient for charging phones while walking. Weatherproofing is ideal but not essential, and internal device compartments are handy. For professional photographers or digital nomads, having plenty of space for equipment is vital. A clamshell bag design is great for this, and anti-theft protection can be an added touch of security when carrying expensive equipment around. You’ll also need a high-wattage solar panel to charge multiple devices at a time. And for those looking to hike, camp or prepare for an emergency, a durable bag with weatherproofing and a detachable high-wattage solar panel is perfect. Quality of construction is very important, as is the quality of the solar panel as you can’t risk it malfunctioning. It’s better to spend more money on a top-tier model in this case. Most buyers are only looking to charge small devices, like smartphones or iPods. 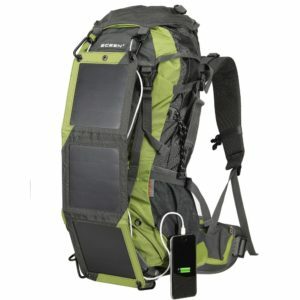 Any backpack with a solar panel above 5W can reasonably accommodate small devices in full sun. It will take a few hours longer to charge in cloudy conditions, so an external battery bank is essential for power storage when the light is dim. Some backpacks come equipped with battery banks, but others don’t, which may be an important consideration when picking a bag. If you’re planning on charging high-capacity devices, like laptops, you’ll need more power. A 10W panel is enough to charge a laptop, although it will take several hours. These types of devices also require adapters and power banks as they don’t charge via USB. Most backpacks aren’t suitable for fully charging a laptop and are instead used for smaller devices. There are few models and brands out there that can accommodate such power-hungry electronics, but they will cost upwards of $200. Depending on the nature of your activities, you may need extra features like suspension systems, hydration bladders, or waterproof fabrics. Size may also be a factor as well as it can weigh you down if you have too much extra space. There are a variety of options on the market for specialized use, but in some cases, a standard backpack made of durable materials may be just fine. For those who are doing particularly strenuous activities, like running or cycling, a small daypack is the best option. These bags are lightweight, made with breathable mesh and fit close to your body. Some of them also come equipped with hydration bladders and waterproofing. If you plan on doing long distance hiking or camping, you’ll need a large bag that can protect your devices from the elements. This may include waterproof material or built-in rain covers. Having a detachable solar panel is also particularly useful because you can tuck it away when it’s in danger of receiving damage, or you can leave it out in the sun at camp for remote charging. The size of a backpack is generally in liters (L). This indicates the maximum volume of the bag, or how much stuff you can reasonably fit into the bag before it breaks. Some companies factor in extra side pouches or compartments, while others calculate based on the bag’s dimensions. Generally speaking, a “normal” backpack is somewhere in the 15-25L range. This is enough room to carry a laptop, some books, a water bottle, a few pieces of clothing and other miscellaneous items. Most buyers would prefer this mid-range size as it’s not too bulky for daily use and has the capacity to carry daily essentials. Smaller “daypacks” are usually in the range of 8-10L and can only handle small loads up to a few pounds. These are great for athletes, especially cyclists, or those on short hiking excursions. On the other hand, long-distance hiking backpacks range from 30-100L and can carry a large amount of equipment, like camping supplies. If you’re planning on hiking for more than a few days, you’ll need a minimum of 60L. 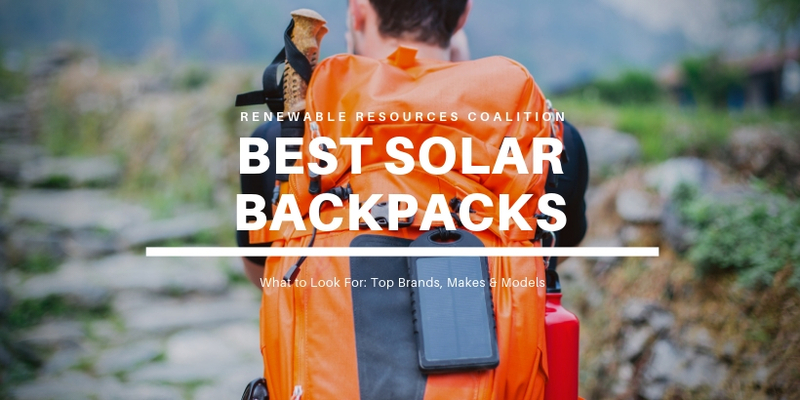 Based on our specified criteria, we’ve narrowed down a competitive list of options to feature the 6 best solar backpacks. Our rankings specifically focus on the power of the solar panel, the size of the backpack and the overall quality of design. It also takes into consideration the unique use of the bag depending on the buyer’s intentions. Most solar backpacks are equipped with solar panels ranging from 5W to 12W. 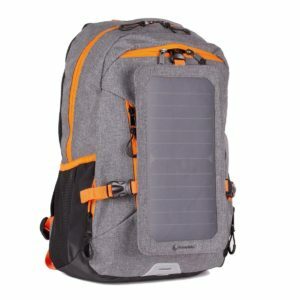 It’s rare to find a bag with higher capacity solar panel than 12W, and any panel less than 5W is relatively useless as it will take too long to charge your devices. In general, the higher the watts, the quicker the charge time. Standard backpacks range in size from 8L to 100L, and solar backpacks are no exception. Most normal solar backpacks are around 20-25L. This is enough space to carry the essentials and your charging devices. Be aware that the larger the bag and panel, the more weight you’ll be carrying on your back. The overall quality of the backpack and solar panel are very important. Poorly constructed bags will not hold up when used daily or in outdoor environments, which puts your expensive electronic devices at risk. Similarly, solar panels that are not protected or well-made can be easily damaged and will more than likely malfunction. This inconvenience can become more serious in emergency situations. Can you charge a laptop with a solar backpack? Can you wear your solar backpack in the rain? Will I need to purchase a battery bank or charging cords? How long do solar backpacks last? Some solar backpacks have the capacity to charge laptops, but not all. It really depends on your battery bank and whether it can accommodate an AC laptop charger. Some backpacks come equipped with battery banks, but only one model (the Voltaic System) can handle a laptop. Alternatively, you can purchase an external laptop battery separately and hook that up to your high wattage solar panel. In general, light rain will not damage the solar panels on an average backpack. Most solar backpacks come with some form of weatherproofing, although not all of them are 100% waterproof. However, while the website may claim that the backpack is waterproof, it’s often better to be safe than sorry. Backpack rain covers are cheap and can easily fit over a bag, quickly protecting your sensitive electronics. Most solar backpacks already come with a battery bank. Some even come with USB charging cords. However, not all do. Depending on what you plan to charge, you may want to purchase an external battery bank and cords that are specific to your devices. This is especially true for charging laptops or drones. 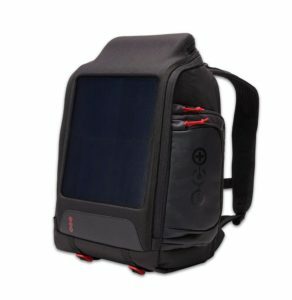 Solar Backpack Power bank included? Quality of construction and amount of use determines the life span of a solar backpack. Backpacks that you use daily will not last as long as ones you use for the occasional excursion. Solar panels also naturally degrade every year, but usually at a very low rate. Most solar panels will last for years if they aren’t otherwise damaged. Some solar backpack companies offer warranties for their bags, which may put your mind at ease. These warranties are usually 1 year, and may cover manufacturing errors, degradation or other common solar issues. It’s important to check with the supplier first before purchasing so you can understand their individual policy.